The BMS series is a completely new range of booster modules pumps mainly used for seawater and brackish water reverse osmosis filtration applications. With many materials selection options it features a directly coupled pump powered by a permanent magnet motor and VFD. All critical components in this series that are in contact with water, are made of Super Duplex and Stainless Steel. Thin, non-explosive liquids, not containing solid particles or fibres. The liquid must not chemically attack the pump materials. In case of doubt, contact US. The pumps must never operate with liquid containing substances that would remove the surface tension, e.g. soap. If you use this type of detergent to clean the system, lead the liquid around the pumps via a bypass. If the density and/or viscosity of the pumped liquid is higher than that of water, it may be necessary to use motors with a higher output than the standard output stated. 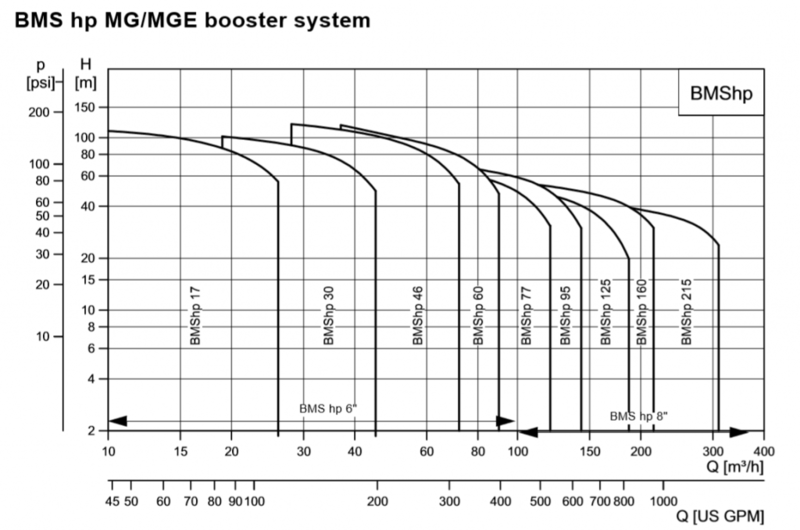 BMS hs booster systems are designed for brackish water and seawater.Maximum liquid temperature 40 °C (104 °F). The guidelines below apply to the curves on the following pages. • All curves are based on average values according to ISO 9906: 2012 3B. • If a minimum performance is required, carry out individual measurements. • The curves apply to a kinematic viscosity of 1 mm2/s (1 cSt). 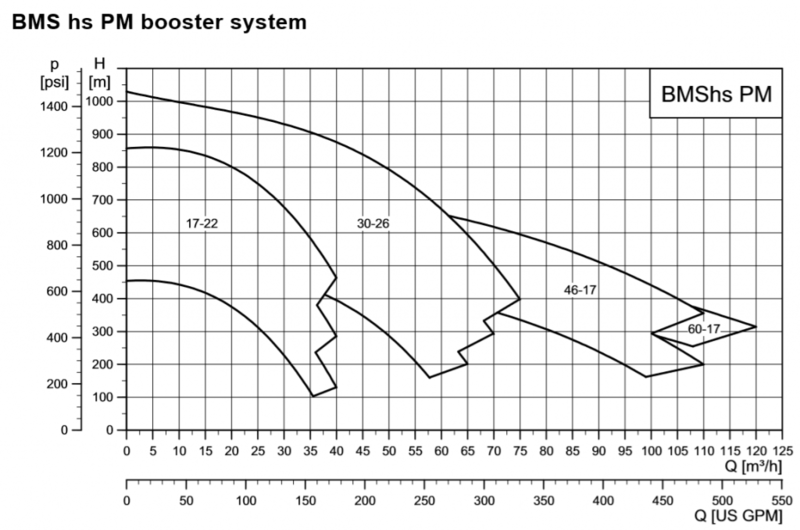 • The power curve P2 (hp) shows pump input power per stage. 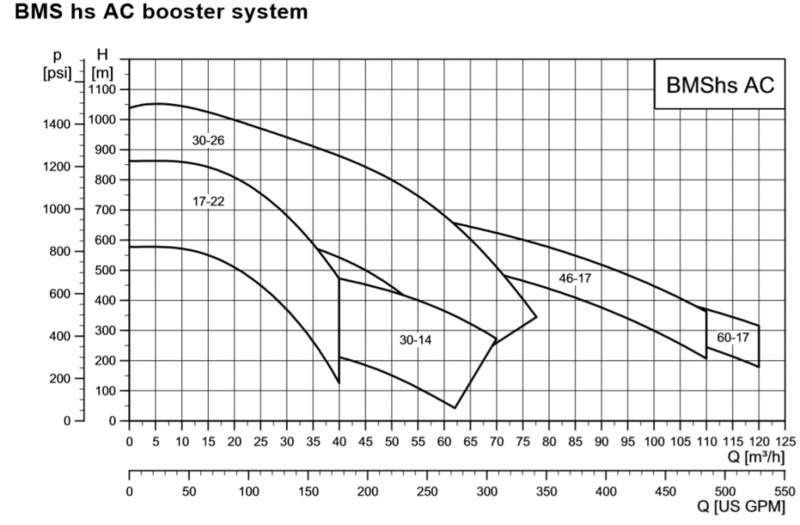 • The efficiency curve η shows pump efficiency, including BMS hs pump, motor and frequency converter. • The performance tests have been made at a water temperature of 20 °C (68 °F). • Test liquid: airless water. The conversion between head H (m) and pressure p (kPa) has been made for water with a density of ρ = 1000 kg/m3(62.4 lb/ft3). If the density differs from this value, the created pressure will be proportional to the density. If a flow rate higher than that of a single module is required, several modules are connected in parallel. Find the resulting flow rate by adding the flow rate of each individual module. The pressure will be the same as for one pump. When the booster system is used in a reverse osmosis system or similar applications pumping seawater or aggressive water, install a flush pump to avoid corrosion. Flush the system with clean fresh water until the salinity is lower than 1000 ppm TDS in the entire system. BMS hs, BMS hp, BMST: Filter the raw water to maximum 30 microns. BMSX: Filter the raw water to maximum 10 microns. To protect the pumps against dry running, fit the system with flow and pressure control devices. A pressure switch on the inlet side is sized in accordance with the estimated inlet pressure. At a pressure lower than 1 bar (14.5 psi), an alarm is given and the pump will stop. We recommend that you fit all outlet connections of the system with flow switches that will stop the system at the set minimum flow rate. The control devices ensure a correct inlet pressure. Flow switch cutting-in is adjusted for a minimum time delay corresponding to the maximum starting frequency of the system. The safety devices below must be built into the system to protect the pump. See fig. 7. • Flow switch and/or low-pressure switch to ensure a minimum flow of water and lubricate the thrust bearing and pump bearings. • Flowmeter in each outlet pipe. • Low-pressure switch on the booster system inlet sized in accordance with the estimated inlet pressure. At a pressure lower than 1 bar (14.5 psi), an alarm is given, and the pump will stop. • High-pressure switch on the outlet pipe. The high-pressure switch will stop the pump at a set maximum pressure. The above safety devices ensure a correct inlet pressure and a minimum flow for lubrication. A minimum time delay equivalent to the maximum starting frequency of the system has been set for flow switch cutting-in.